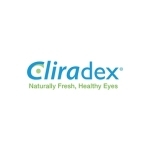 foaming eyelid cleanser on its newly redesigned website, www.cliradex.com. International purchases may be directed to Amazon Marketplace. care, everyday ocular hygiene and mild-to-moderate ocular irritation. the product’s importance in a daily eye care regimen. An integrated branding experience with our packaging for consistency. Product placement for easy access to important information. Our money back guarantee, which is also given prominent visibility. A new blog with a Facebook newsfeed. severe diseases such as dry eye. cleansers formulated with 4-Terpineol, a molecule found in tea tree oil. scientific research and clinical studies.